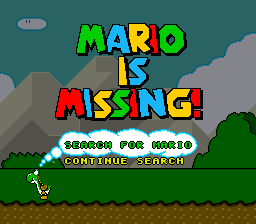 When the title screen has completed loading (Search for Mario and Continue Search is displayed), press L + R + Select + Start on Controller 2. 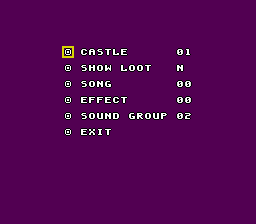 A menu will appear that comes with a sound test, a starting castle modifier, and an option that says "Show Loot". This only works on the English version of the game. Setting "Show Loot" to Y (or Yes) allows the player to see if a Koopa has an artifact. By pressing R or Select to view the map, blinking Koopas will appear to show that they do have an artifact. Setting "Castle" to 2 or 3 will make Luigi start on the second or third floor, respectively. This page was last modified on 20 November 2016, at 21:51.